Today’s modern factory finishes incorporate multiple layers of highly specialized paints. 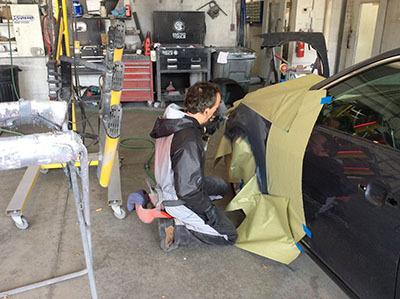 Rodenhouse Body Shop has made a major investment in the finest paint system available and constantly upgrades its technology and equipment to ensure that each vehicle’s paint matches. We use PPG envirobase high performance base coat then top coated with PPG finest high solids clear. Using PPG high performance from start to finish allows us to provide one of the industries best warranties. We take special pride in our ability to match factory finishes as the final step in the restoration process. 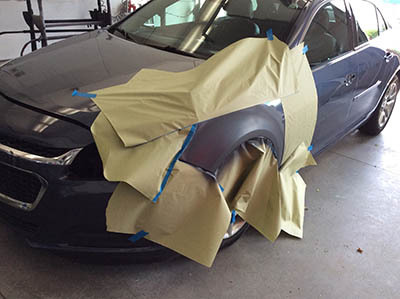 Our paint preparation area is where your vehicle is prepared for paint by sanding and applying primer and sealer. After your vehicle is done in the spray booth, it is sent back to this area to cool down before being sent back to the body shop for reassembly. 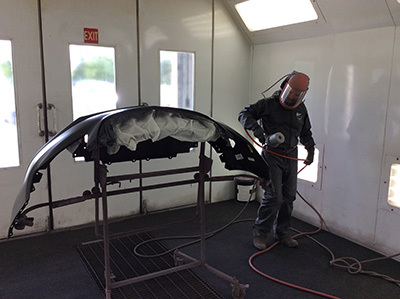 We use downdraft spray booths to give your car a dirt-free, long-lasting finish. After applying clear coat, your vehicle is baked to give the paint durability and a high gloss that will last for the life of your vehicle.